Animonda Carny Kitten Baby-Paté is tasty, balanced and healthy food for your kitten from 4 weeks of age. The wet food has a creamy, delicate texture and it contains 100% fresh meat. 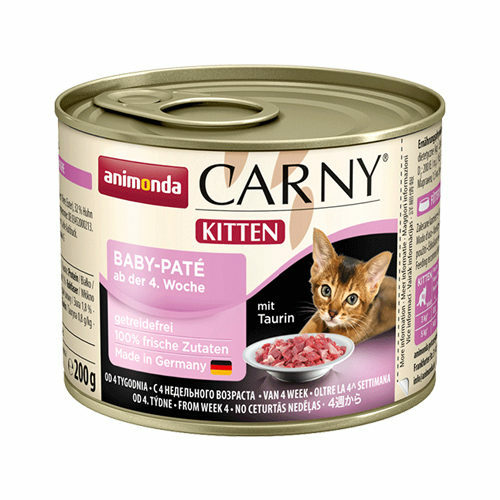 Carny Kitten Baby-Paté from Animonda is delicious wet food for kittens from 4 weeks of age. Baby-Paté has a soft, creamy consistency, that aids the transition when weaning from mother’s milk to solid foods. The paté is enriched with 100% fresh, meaty ingredients and taurine. It does not contain any grains or soy. The food has been specifically tailored to meet the nutritional needs of kittens up to 16 weeks old. 38% beef (lung, meat, heart, kidney, udder), 32% chicken (meat, liver, stomach) and calcium carbonate. Have you used Animonda Carny Kitten Baby-Paté before? Let us know what you think about this product.